EPA Studies Reveal Indoor Air Quality is as great as 2-5 Times MORE Polluted Than Outdoor Air Levels… And Most Of Us Spend 90% Of Our Time Indoors! If you are manifesting any of the symptoms mentioned below as a result of being exposed to mold, contact your physician immediately. Mold is found everywhere, indoors and outdoors. It is common to find mold spores in the air of homes and growing on damp surfaces. Much of the mold found indoors comes from outdoor sources. Therefore, everyone is exposed to some mold on a daily basis without evident harm. 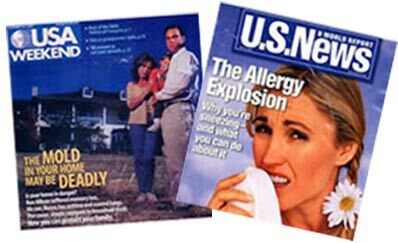 Mold spores primarily cause health problems when they enter the air and are inhaled in large amounts. People can also be exposed to mold through skin contact and eating. How much mold exposure will make me sick? It depends. For some people, a relatively small number of mold spores can cause health problems. However, for most people it may take exposure to a large number of mold spores before health issues occur. The basic rule is, if you can see or smell it, take necessary steps to eliminate the excess moisture and remove the mold permanently. Depending on the amount and type of mold present, most allergic reactions will vary based on an individual’s sensitivity to mold. In addition, certain types of molds can produce toxins, called mycotoxins, which the mold uses to inhibit or prevent the growth of other organisms. Mycotoxins are found in both living and dead mold spores.